Today, Europapharmacy asked me what my weekend away essentials are so I thought I would do a little bit of a product post, something a little bit different here on Georgina Does. So you already know that every few months, Andrew and I are off on a little overnight trip into London for one occasion or another and last week we had our late Valentines Day trip. It was really lovely and we stayed in the most amazing room but I have a few other posts to come for that! 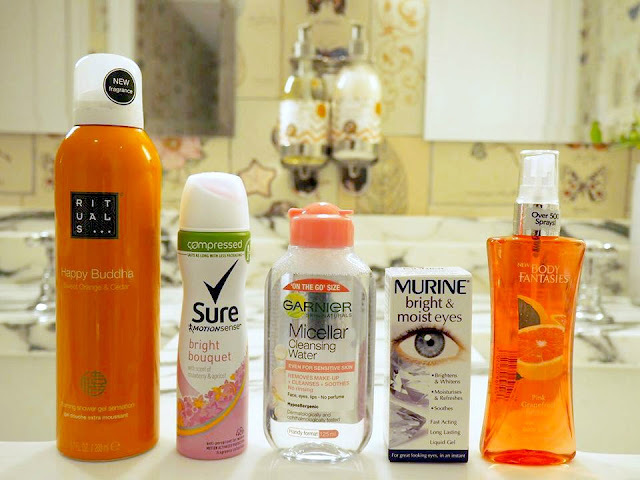 Of course I took along all the essentials, toothbrush, contact lenses ect but I thought I would talk you guys through five new products that I have acquired recently and brought along. As you'll learn, I love anything mini when I'm travelling. The first in the photo is the Happy Buddah foaming shower gel from Rituals. This is the strangest product - as the name suggests, as soon as the gel touches your skin, it starts to form a soft, dense foam and this particular one has the nicest, orange, citrus smell. I first discovered it at Andrews house - his mum buys all the nice bath stuff but once it ran out, I had to go and get my own because I loved it so much. I wonder if they do a travel sized one. Next in line is my new Sure compressed deodorant. These smaller, compressed cans are a much better size to pack for a weekend away as well as being much better for the environment. I have been loving this new bright boutique scent as it's super floral and fruity which makes a nice change for a deodorant as well as keeping me feeling fresh all day. It also contains Motion sense technology, which means that the more you move, the more it protects. Clever stuff! Micellar water is a relatively new product to me. I have a big one at home but decided to pick up a mini in Boots because I needed one to leave at Andrews house for the weekends too. Again, this one is the perfect size to take away with me! In the past I had just taken a small pack of wipes with me but with Micellar water my skin actually feels good after I use it, that is definitely not a feeling I get with wipes. Forth is a product that I am totally new to but they seem to have found their way into my day to day essentials so of course, I brought them along. I was introduced to the brand when they invited me to an awesome event a couple of weeks ago. It finished up with me riding a motor bike though London during rush hour but before all of that madness we had a masterclass with Lisa Eldridge to show us how to work eye drops into our daily routine. I was given all four of the products but am loving the Bright & Moist one for keeping my eyes moisturied and refreshed. I actually used them this morning as I have been absolutely exhausted this week - I love how they instantly make me look much brighter and awake! And lastly is a new body spray! I do love a body spray and usually for me as a Victoria's Secret one - Love Spell is my favourite but for travelling, I love these Body Fantasies ones, they are the perfect size! I have a couple of scents but the one I took with last weekend is the pink grapefruit one because as I mentioned before I love citrusy smells! I take my mini bottle of micellar water everywhere with me! They're so much easier than their regular(MASSIVE) sized bottles! That foaming shower gel sounds really interesting haha! I really want to try it out! I prefer taking body sprays with me on weekend trips just because i'm always so terrified that i'll smash my entire perfume bottle haha! I use the Murine Bright& Moist Eyes too as my eyes are dry as I suffer from dry eyes - it is great!